MRP’s Ramp Control Cartridge line-up now includes options RockShox Pike, Lyrik, Yari, and Boxxer (solo-air only), and Fox 32, 34 and 36. Colorado’s MRP continues to add to its ever-growing product line-up with a yet another tuning option for suspension forks. Joining its expansive line of after market Ramp Control Cartridges is a new Fox 36 option. Price is $180 and install is a 20-minute job that takes just a few basic tools. Just note that this is the lone MRP Ramp Control Cartridge that does require lower leg removal. The end result is an alternative to volume spaces that adds a high performance speed sensitive adjustment, where you can tune big hit characteristics independent of other air spring and damper settings. This velocity-dependent damping allows you to have a fork that’s supple and comfortable at low and moderate speeds, but supportive and composed when the trail gets truly rowdy. And it’s adjustable on-the-fly on the trail without tools or a shock pump. Ramp Control affects the fork’s ending stroke spring curve, giving you more support for big drops or when plowing through rock gardens at high speed. Weight is 55 grams, which is lighter than most air spring assemblies with two or more tokens added. 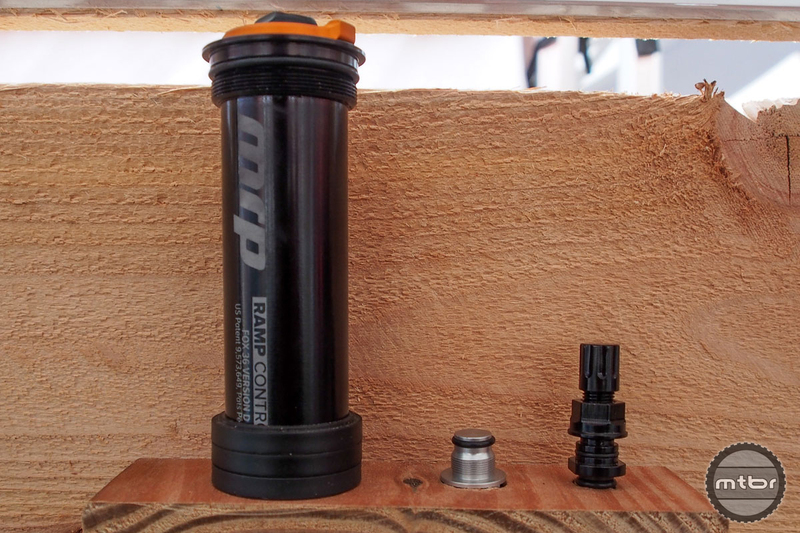 Other cartridge options include RockShox Pike, Lyrik, Yari, and Boxxer (solo-air only), and Fox 32 and 34. Press play to learn the basics of MRP Ramp Control installation. 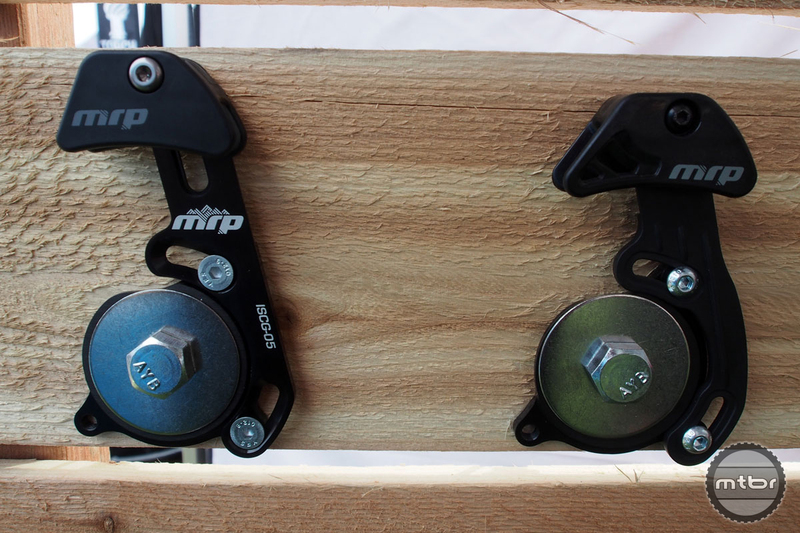 MRP also has a new lightweight upper chainguide, the 1x CS (short for Cores Series), which is a more budget friendly version of the popular MRP 1x V3 for 1×10, 1×11 and 1×12 drivetrains. For $40 (versus $75 for the V3 model) you get a 33-gram guide that works with single chainrings from 28t-34t (or oval to 32t), and requires no crank or chainring removal for installation. The 1x CS uses a composite backplate and a more basic nylon upper guide. There is no trade-off in performance, just fewer features and more basic materials and construction, and perhaps a little additional noise. The new guide (right) bears little difference to its sibling save a lower price and lack of co-molding in the guide channel. 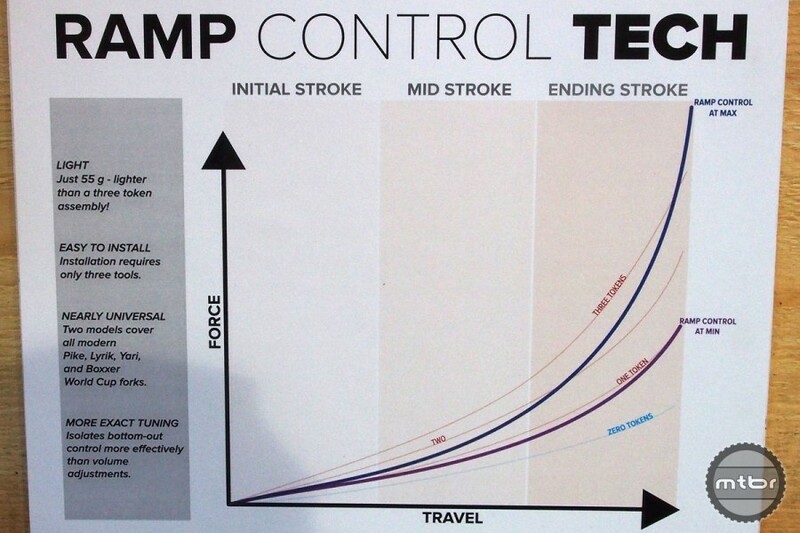 For more info on the Ramp Control cartridges head to www.mrpbike.com. Get further details on the new chainguide here.